We love the line so much we use it in our own family to this day. I’ll whip it out almost anytime someone’s doing something extreme, like my son Lucas today who just stayed up all night, watched School of Rock, and wore shirt sleeves outside–in 16 degrees! School of Rock is inspirational. School of Rock is not for the faint of heart. 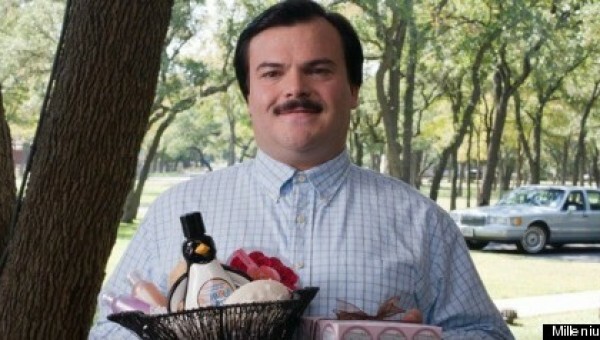 Jack Black’s comic and singing strengths in a single character–and his original character–make for enduring cinematic satisfaction. The movie is also all about Joan Cusack, and an unforgettable soundtrack perfectly tuned to the scene, like Metallica’s “Jump in the Fire” at the scene where they sneak off campus for the Battle of the Band tryouts, and also an appropriate peppering of AC/DC. One of the other few movies that succeeds while also showing Black’s range. This dark, satirical drama is executed in a perfectly original way by the sheer earnestness and effeminate grace that Black inhabits for the role of the enigmatic Bernie, and also under the original direction of Richard Linklater. I just watched this for the second time after a couple of years, and it struck me more this time how many scenes he delivers for his spot on gospel singing. Linklater said that Black had no sooner interviewed the real Bernie in prison than he already had the essence of Bernie. This underrated dramedy–you could almost call it a farce–directed by Noah Baumbach, depicts a dysfunctional family in the midst of their private wars, and in the context of a wedding. It’s sister against sister, mother against son, neighbor against neighbor, lover against lover. They do love one another. If they didn’t, they couldn’t suffer hurt the way they do, with well-aimed humiliation, cruelty disguised as solicitude and strategic displays of sensitivity and callousness. Margot’s sister, Pauline, seems to have made a vocation out of insecurity and self-scrutiny. Jack Black plays her fiancé, Malcolm, whom she describes as “brilliant,” and who dabbles in music, painting and letters to the editor. Things fall apart, as they say, to such an extent one might call it melodrama. It’s the intimacy of the characters’ inner lives, the brilliant cut-scene work and French-influenced cinematography, as well as Baumbach’s general avoidance of cliche, that gives this picture such memorable texture. Okay, look! Where do I begin? When I was younger, I suffered from terrible allergies that kept me indoors. And all the kids threw rocks at my window and called me names. So I created my own friends. Monsters, demons, ghouls to terrorize my neighbourhood and all the kids that made fun of me. And they became real to me. And then one day… they actually… became… real. My monsters literally leapt off the page. As long as the books remain locked, we’re safe, but when they open, well, you’ve just seen what happens. Upset about moving from a big city to a small town, teenager Zach Cooper finds a silver lining when he meets the beautiful girl, Hannah, living right next door. But every silver lining has a cloud, and Zach’s comes when he learns that Hannah has a mysterious dad who is revealed to be R. L. Stine (Jack Black), the author of the bestselling Goosebumps series. It turns out there’s a reason why Stine is so strange, and the above quote pretty well sums it up. When Zach unintentionally unleashes the monsters from their manuscripts and they begin to terrorize the town, it’s suddenly up to Stine, Zach, and Hannah to get all of them back in the books where they belong. A cheerful, nasty delight of a movie, and another stellar example of Black at his eccentric best. Top five things I miss about Laura. One; sense of humor. Very dry, but it can also be warm and forgiving. And she’s got one of the best all time laughs in the history of all time laughs, she laughs with her entire body. Two; she’s got character. Or at least she had character before the Ian nightmare. She’s loyal and honest, and she doesn’t even take it out on people when she’s having a bad day. That’s character. 2000’s High Fidelity, about the emotional travails of a music-obsessed sensitive soul with a checkered romantic past (played by John Cusack), is a brilliant adaptation of Nick Hornby’s debut novel. The script makes plenty of room for scene-stealing supporting players, led by Black as a cranky record store employee whose snobbery is leavened by a hyperactive, wide-eyed overconfidence Black would soon bring to bear on a long list of comedies. Runner Up? Shallow Hal. #1 Flop? Nacho Libre. Zany enough premise to just maybe work. Let’s just say, a cult classic it is not. But seriously, as a serious creative, the kind Hanging Chad has always and will always discuss and explore, Jack Black deserves his due.